1.Prepare Cookies: Position 2 oven racks to upper and lower positions; preheat oven to 375°F. Line 2 cookie sheets with parchment paper. 2.In large bowl, with mixer on medium speed, beat sugar and butter 3 minutes or until fluffy, scraping bowl occasionally with rubber spatula. Add vanilla extract; beat until combined. With mixer on low speed, add salt; add flour in 2 additions, scraping down bowl between additions. 3.Transfer dough to work surface; form into a disk and wrap in plastic wrap. Refrigerate dough at least 1 hour or up to 2 days before rolling. 4.On lightly floured work surface, roll dough to about 1/4-inch thick. 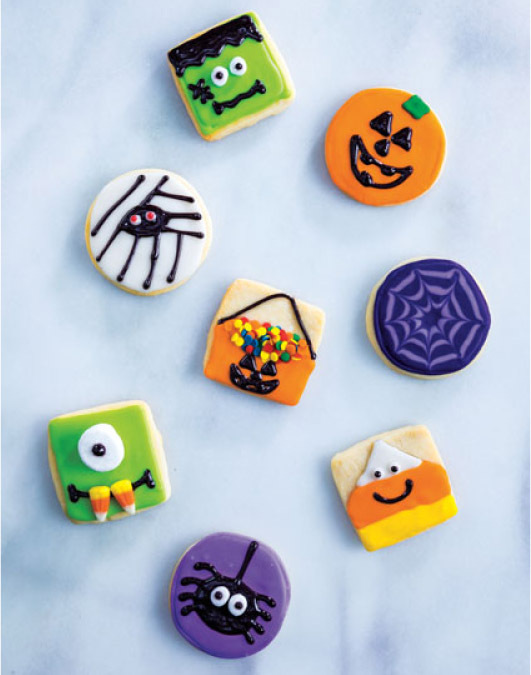 With 2-1/2-inch round or square cookie cutters, cut out cookies; transfer to prepared cookie sheets, 2 inches apart. Gather dough scraps and reroll to cut out additional cookies. 5.Bake cookies 12 to 14 minutes or until cookies are set and edges are lightly golden, rotating cookies sheets between upper and lower racks halfway through baking. 6.Remove parchment paper with cookies from pans; cool cookies on parchment paper at least 30 minutes before decorating. Store cooled cookies in an airtight container for up to 3 days. 7.Prepare Icing: In large bowl, with wooden spoon, stir together all ingredients until smooth; divide into smaller bowls and add/combine Color Gels to create desired colors. Frost round cookie with white icing; dry 30 minutes. Use black write-on gel to draw and fill in an oval in center of cookie for face. Starting around edges of face, draw equally spaced, parallel lines in varying directions. For eyeballs, place 2 dots of white icing in center of black oval; use red write-on gel to add small dot in center of each eyeball for pupils. Frost round cookie with purple icing; dry 30 minutes. Use black write-on gel to draw and fill in a circle in center of cookie for body. On 2 sides of body, draw 4 legs; draw 1 line from top of cookie to body to look like spider is hanging from a web. For eyeballs, with scissors, cut mini marshmallow crosswise in half and place on black circle; add small dot of gel in center of each eyeball for pupils. Frost bottom two-thirds of square cookie with orange icing and sprinkle top area of icing with edible confetti; dry 30 minutes. Use black write-on gel to draw a handle for bag and jack-o-lantern face. Frost square cookie with green icing. For eyeball, cut large marshmallow crosswise in half; place 1 half on upper center of cookie. Dry 30 minutes. Use black write-on gel to draw mouth; for fangs, add small dot of gel to back of 2 candy corns and place on mouth. Add small dot of gel in center of eyeball for pupil. Add white icing to piping bag with plain tip or zip-top plastic bag with a small corner snipped off; pipe a white triangle on upper third center of square cookie. Use orange icing and yellow icing to complete candy corn; dry 30 minutes. Use black write-on gel to draw mouth. For eyeballs, place 2 dots of white icing on white section; add small dot of gel in center of each eyeball for pupils. Frost square cookie with green icing. For eyeballs, cut mini marshmallow crosswise in half; place in center of cookie. Dry 30 minutes. Use black write-on gel to draw hair, stitches and mouth on face; add small dot of gel in center of each eyeball for pupils. Frost round cookie with orange icing, adding a small square of green icing on 1 side of the cookie for the pumpkin stem; dry 30 minutes. Use black write-on gel to draw a jack-o-lantern face. Frost round cookie with purple icing. Immediately add contrasting colored icing to piping bag with plain tip or zip-top plastic bag with a small corner snipped off. Starting in center of cookie, draw 4 concentric circles over purple icing. To create spiderweb effect, place tip of toothpick in center of cookie and drag outward to edge; repeat to complete spiderweb. Note: Store decorated cookies in a single layer in an airtight container for up to 3 days; do not stack.